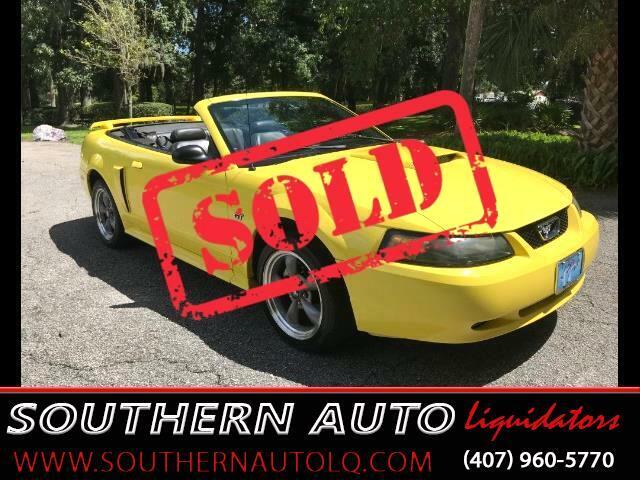 You are looking at a “Zinc Yellow” 2001 Ford Mustang GT Deluxe Convertible. The Ford Mustang is an American success story. Forty years after it created an automotive niche all its own, Mustang is both true to its roots; and better than ever. The Mustang boasts distinctive styling - It couldn’t be mistaken for anything else. It makes a statement. It's still relatively big for a sporty car, with plenty of available options, and small-block V8 power. With the latter, there's plenty of torque. The engine sounds great at full song, urging you to keep your foot in it. And excellent handling response keeps you involved. Performance is what the Mustang GT is all about. Its 4.6-liter, SOHC modular V8 produces 260 horsepower at 5250 rpm, with 302 pounds-feet of torque at 4000 rpm. And it sounds great, whether cruising or at full throttle. In 2000, the GT engine benefited from revised camshafts and intake manifold runners, and larger valves for improved airflow above 3000 rpm. A new coil-on-plug ignition system replaced the previous ignition for higher-energy sparks. This GT Deluxe Convertible is gorgeous, inside and out. The unique Yellow Exterior paint is in great condition and the inside is pristine. The Black Top is in excellent condition, as well, and works perfectly. It comes fully equipped with: Keyless Remote entry, Power windows, locks, driver’s seat and convertible top. Ice Cold A/C. And a 230-watt, 10-speaker Mach 460 system with in-dash, six-CD changer. The Mustang is merely the best. And this car proves it. Give us a call today to schedule a test drive.